We had a snow day yesterday, so the Dude and I used the time to do some Valentine's crafts. A couple of weeks ago, I got the leftover scraps from the kids' sewing class at my LQS - the polka dots from Deb Strain's Always & Forever. There was fusible web on the back, and I thought about peeling it off to salvage the fabrics. But then this was on Moda Bake Shop. And peeling fusible web off is really, really hard. My hearts are 4.5" and backed in muslin scraps, because that's what I had. 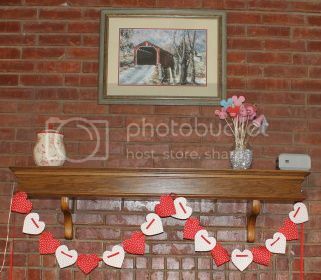 And my mantel is a little less boring. 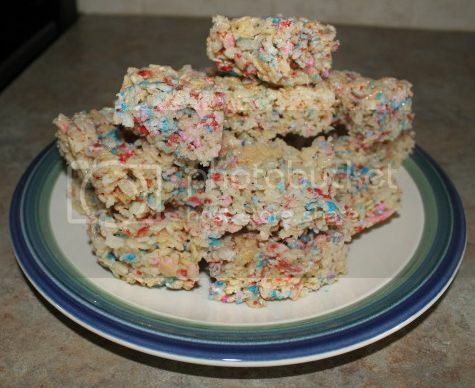 Remember when there was colored Rice Krispies for holidays? I swear I'm not crazy... Anyway, I set out to recreate that. I was smart enough to add them at the very last minute, but they still got messy and somewhat melty. I also pressed a heart into the Dude lunch sandwich with a cookie cutter, and I'm going to lunch with my husband. He has to work late, so the Dude will be my dinner date. I'm happy to get special time with both my boys!